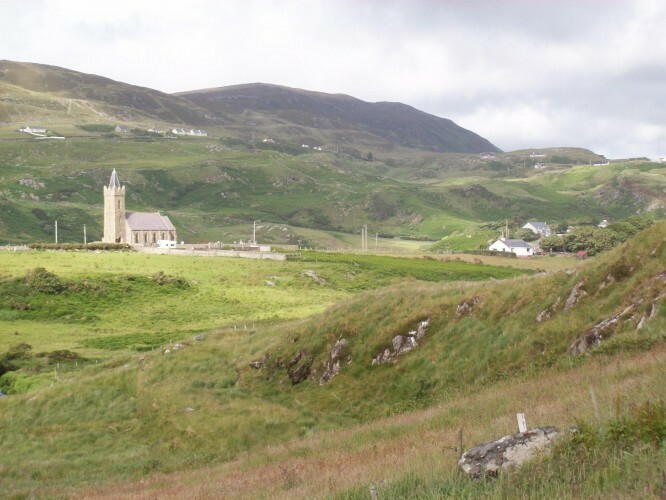 Eaglais Cholm Cille, Gleann Cholm Cille, Co. Dhún na nGall, Éire/St. Columba’s Church, Glencolmcille, Co. Donegal, Ireland. Photo 2008, by Audrey Nickel. Why Give Your Baby an Irish Name? An Irish Gaelic name for your child can be a precious connection to his or her Irish heritage, and a link to centuries of Irish tradition. Many of these names have been in use in Ireland for 100s of years…some even come from Irish mythology! Irish names also look and sound beautiful, and lend that unique touch that many parents hope to bestow on their children. Irish Gaelic is Ireland’s native language. It’s a member of the Celtic family of languages that includes Manx, Scottish Gaelic, Welsh, Cornish, and Breton. You can give your child an even more precious link to his or her heritage by learning something of the Irish language yourself! Our free one-month Irish For Beginners course, which includes our e-book “Learn Irish Gaelic Online — All you need to know” (a $19 value) is an easy, risk-free way to get started with the language! * Top names are based on several factors, including the 2010 Irish National Census and baby naming trends in the U.S.